Suddenly it became much easier to start your own mining pool for Ethereum or any of the forks that it already has thanks to Weipool who have released their full pool source code. You can find the source code of the pool backend, it is relying on geth as an Ethereum client as well as the source code of the pool frontend. Aside from the Geth Ethereum client the pool software needs Redis and Node.js, there isn’t much documentation available, but you should be able to quickly figure things out. The front-end is pretty basic, so you might want to make it a bit more prettier and more functional, but other than that you should be able to have a basic pool up and running in no time. 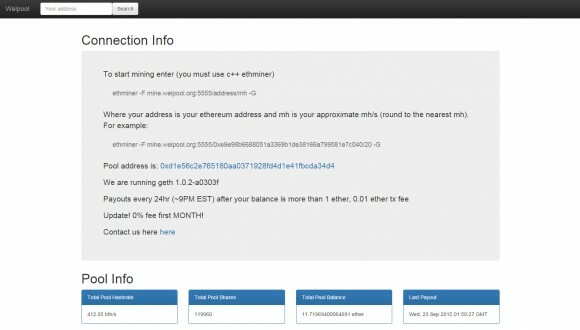 You can visit Weipool for a working example of the code, unfortunately the pools itself has not managed to attract a lot of miners and keep them there, even though it was announced when there were not that much pools for Ethereum available.